Show your true colors in these preppy looks! Over the past couple of years, Halsey has seen an immense rise to fame; and, judging by her unique sound and outspoken nature, it’s clear that this is just the beginning for her! Although Halsey has released quite a few amazing songs, “Colors” remains one of my favorites. Furthermore, the music video is a testament to Halsey’s versatility when it comes to style, as we see her turn in her usual edgy looks for a much more understated and preppy aesthetic, which she pulls of perfectly. If you haven’t already, take a look at the video below, and then keep scrolling to see the “Colors”-inspired looks that I’ve put together. This simple and sporty look is similar to the outfit that Halsey wears at the tennis club in the video. It’s also the perfect way to ease into wearing dresses if your style is more tomboy than girly, because of its no-fuss athletic vibe. Start off by putting on a classic white sleeveless shirtdress; I love the elegant fit-and-flare style of this one. Next, slip on some white canvas sneakers to up the preppy vibes, and grab a trendy canvas backpack that is the perfect size for all of your essentials. Also, the navy blue color of this backpack is the perfect way to reference the lyrics of the chorus of “Colors”! Finish off the look with a minimal white baseball cap and a cute tennis charm bracelet — a subtle reference to the game of tennis played in the video — and you’ve got yourself a look that is as effortless to put together as it is chic! 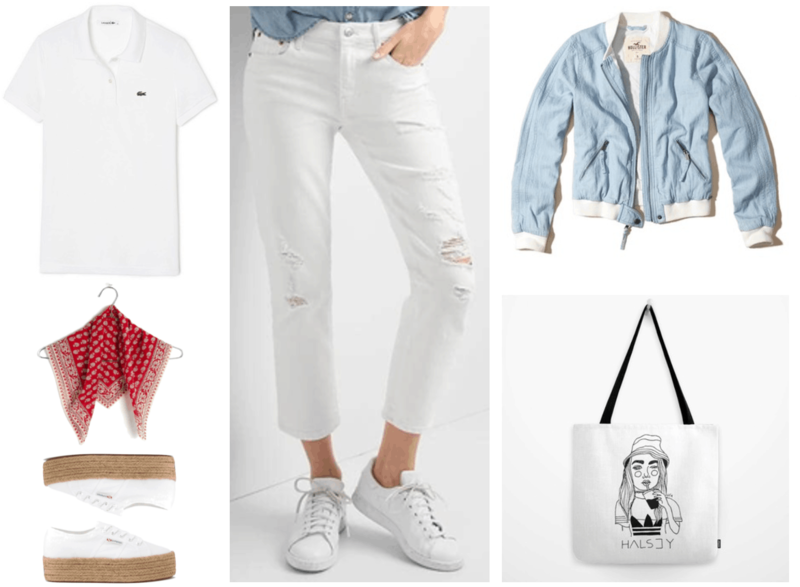 If you’re looking to put a bit of a twist on clean-cut classics, then look no further: This outfit, inspired by the one that Halsey’s on-screen boyfriend wears while playing tennis, puts a unique spin on preppy essentials. Polo shirts are a staple in any prep’s wardrobe, so put on this white Lacoste one — the women’s version of the one that Halsey’s on-screen boyfriend wears — for a clean, classy look. Instead of pairing it with white trousers, as Halsey’s boyfriend does, mix things up by rocking white ripped jeans. Okay, now let’s take a look at some accessories: I chose this pretty red bandana as a reference to the lyrics from the bridge of the song; it looks equally chic worn around your neck, as a hair-tie, or around the handle of your bag. And, speaking of bags, I couldn’t resist this fun tote featuring a print of none other than Halsey herself! Instead of tennis shoes, rock some modern espadrille-sneaker hybrids that are sure to turn heads. Finally, top the look off with a chambray jacket; you can even tie it around your waist or shoulders if you’re feeling extra preppy! In the video for “Colors,” Halsey wears a beautiful pale blue chiffon dress for dinner with her on-screen mother, boyfriend, and boyfriend’s father. While I unfortunately couldn’t find a similar dress to Halsey’s online, this lovely lace dress is a great alternative. For some extra coverage up top, layer the dress with an off-white cardigan like Halsey does; I chose a plain one to go with the lace dress’ intricate pattern. Finish off the look by putting on a pair of sparkly crystal stud earrings, and then by swiping on some red lipstick, as we see Halsey do in the video, for a look that’s perfect for dinner parties — and upcoming Spring/Summer graduation parties, too! In the video, Halsey wears a school uniform which consists of a white short-sleeved blouse, a navy blue pleated skirt, and black-and-white oxfords. This look is quite similar, except that it takes the schoolgirl theme less literally, making it perfect to wear to class and beyond. Start by pairing a simple white blouse with a cute navy blue pleated skirt. If you choose a flowier blouse like I did here, be sure to tuck it in, as wearing two pieces that flow away from the body can sometimes overwhelm your figure. Next, slip on a pair of oxfords; I love these ones because of their unique cutout detailing, which makes them appear light and airy rather than stuffy. For yet another way to reference the lyrics in the song’s bridge, paint your nails a pretty shade of lilac. To complete the look, pick up a chic (faux) leather tote in navy blue and accessorize with a fun pair of camera earrings. Now that you’ve been inspired by Halsey’s chic and preppy video style, it’s time to get out there and let your true colors shine! What music video should I cover next? What do you think of Halsey’s preppy looks? Do you incorporate preppy pieces into your wardrobe? Let me know in the comments!